When I was younger, I actively disliked this hymn when it was sung on the first Sunday of the new year. The tune was set in a minor key, and had strange intervals that were difficult to remember and sing. The words were also less than pleasing -- as a child I didn't want to hear about the year dying in the night -- it was kind of spooky. Even the rhymes were odd. The last line is so far removed, musically, from the first, that it was only a couple of wears ago that I found that there was any rhyme or reason to it at all. As a child, I just knew that neither the words nor the music seemed to resolve at the end of the verse. Now I really like the hymn, for exactly the same reasons. It's not the same as our other hymns, and that makes it interesting. It's a bit more sophisticated musically and lyrically than many of the others -- it's definitely not one of those hymns you sing on autopilot. Add to that the fact that we only get to sing it once a year, and you have something truly special. I didn't know that there were more verses to it than are in our hymnbook. They're an added bonus! 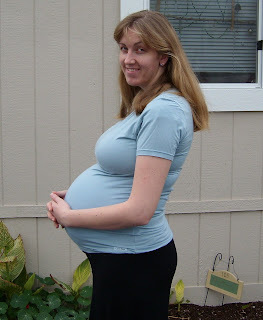 PS: some people have been asking for more recent pictures of me being very pregnant. Here are a couple Peter took yesterday. One of the ladies who serves in the nursery mentioned that she really dislikes that hymn, after we sang it last week (actually I think she said, "I hate that hymn!"). I think I said something like, "Yeah, it's different, isn't it?" "That Easter Morn" is kind of creepy, too. Karen, You look great!!! We sang that song today too. I don't like playing it on the organ, until the very last chord. We also sang that hymn today. I'm kinda glad we sing it only once a year, but I'd miss it if we didn't. Thank you for posting the pictures. You look really cute. I told one of the sisters at church about you today and how uncomfortable you are. She said that she thinks that women get so uncomfortable towards the end so they won't mind going through labor just to not be pregnant any more. :-) Good observation I think. When I read the poem - and yes, we sang it at church today - I thought how appropriate it was with the Iowa caucuses and the NH vote and the double debate last night. I also noticed the lines about the dying cause and party strife, but wanted a positive spin on this post, and couldn't think of how to fit in that comment without sounding bitter. I just about died watching the Simpsons yesterday -- Springfield moved their primary up before New Hampshire, and got so fed up with the politicians and reporters that swarmed the town that they elected Ralphie Wiggum on a write-in campaign, and then both parties, for lack of someone more electable, gave him the nomination (it's OK that he's not 35, the Patriot Act killed the Constitution). By the way, we did NOT sing Ring Out Wild Bells yesterday in church. It made me sad.